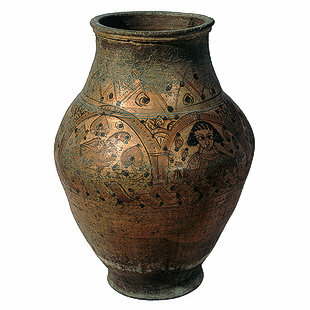 This large jar, or zeir, is decorated with human, animal, and bird figures. It also has inscriptions in red and black representing a human face, birds, and flowers. The artist has decorated the part surrounding the mouth of the jar with geometrical shapes consisting of cross lines covering a branch of braided ornament. The upper part of the body of the jar is divided by the artist into segments, each defined by two columns in red and black with an arch over them. Inside the first segment is a fish. Inside the second are plants. Inside the third is an eagle. Inside the fourth is a human face and an animal, perhaps a bull. These four symbols are probably meant to be the four animals of the Book of Revelations. The fish, however, represents the Lord Jesus Christ. The trifoliate flower resembles the lotus flower, and bears the significance of rebirth. The lower part bears an ornament made by notching.